This dashing young fellow is British actor, David Frankham, as he appeared in the 1961 adventure film, Master of the World. It was the second of three films in which he co-starred alongside Vincent Price, the other two being Return of the Fly (1958) and Tales of Terror (1962). In fact, David credits Price with getting him cast in this role when the original actor had to bow out. But today is a very special day, as today Mr. Frankham hits the age of 90 years old, and is still quite the spry fellow living down in warm and sunny New Mexico! 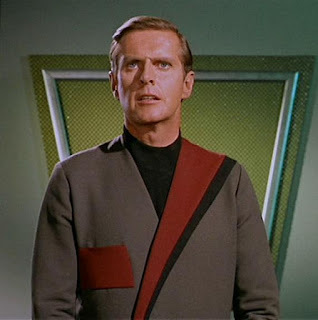 Science fiction TV fans may recall David Frankham from his guest roles in The Outer Limits (“Nightmare”) and Star Trek (“Is There in Truth No Beauty?”) However, to many longtime Disney fans like myself, David Frankham will always be beloved as the voice of Sgt. Tibbs, the heroic little tabby cat who helped rescue the puppies in Disney’s animated classic, One Hundred and One Dalmatians. I’ve written before of how the Disney artists would often try to incorporate some of the physical features and mannerisms from the actors who provided their voices. 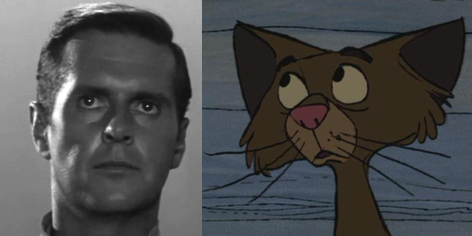 And I believe that they were able to translate some of Mr. Frankham’s facial features into the feline features of Tibbs. The little cat shares his big soulful eyes, small pointed nose that juts out sharply, and especially the pouting lower lip on a small mouth. As it happens, Sgt. Tibbs is my favourite character from the film, as I love the irony of a skinny little cat risking his nine lives trying to protect 101 puppies, knowing full well that as grown-up dogs they’d likely give him a lot of grief! Tibbs moves in quick zigzag patterns, in contrast to the slow plodding movements of The Colonel, his sheepdog commander, and so that also makes him the natural choice to embark on a stealth mission, as he can easily dart through small confined spaces undetected by the two Cockney villains, Horace and Jasper. David Frankham created a quick, attentive vocal mannerism to match his physical movements, and the little cat is so respectful of his superiors, eager to carry out his mission to the best of his abilities. 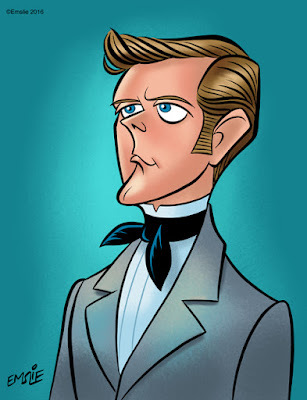 In short, Mr. Frankham and the Disney animators have combined their talents to create a heroic and memorable little personality that will live on in the hearts of all Disney fans forever! So in closing, I want to wish David Frankham a very Happy 90th Birthday and sincere thanks for playing a part in my childhood movie memories! "Nudge, Nudge, Say No More!" Back in the beginning of May 2015, I'd received a freelance assignment that intrigued me and turned out to be a lot of fun to do. The request came from the Just For Laughs company, who are based in Montreal and put together various comedy specials for TV, as well as the Just For Laughs live comedy festivals featuring many well-known and up and coming stand-up comedians. It turns out they were putting together a comedy tour featuring Monty Python alumni, John Cleese and Eric Idle, where the two of them would sit and chat on stage, reminiscing about their work on Monty Python's Flying Circus and the movies that the TV show begat. It was my caricature of John Cleese in his role as the Minister of Silly Walks from a few years back that the folks from Just For Laughs had seen on Google images, leading to their hiring me for this assignment, and they wanted Cleese still depicted in that role. 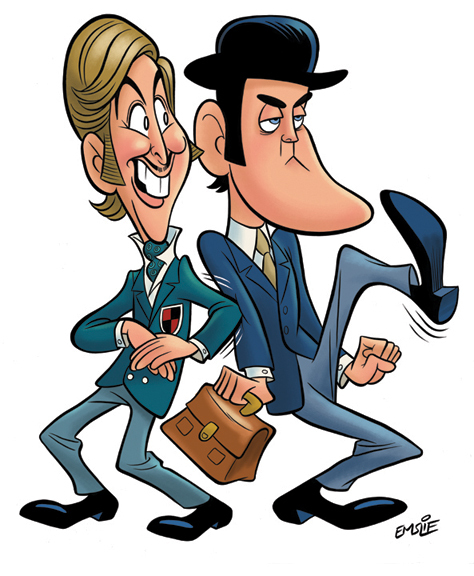 For Eric, I suggested his "Nudge, Nudge" character, as that seemed to me his most iconic role and very representative of Eric's style of humour. They agreed, and I forged ahead on the caricature of this funny duo! The show itself was only scheduled through October, and was limited to Florida and a few other southern state playdates. 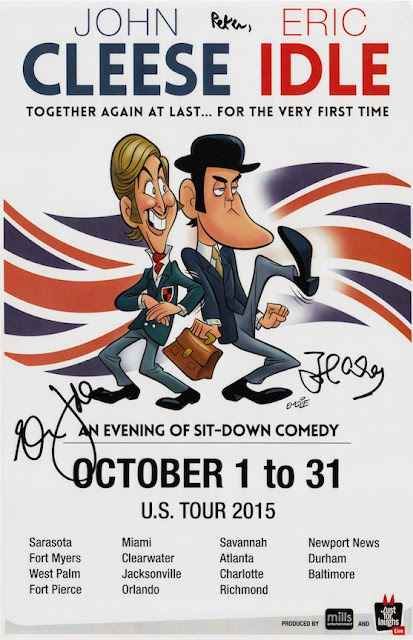 Cleese himself joked about how it was really just a good excuse for an all-expenses paid Florida vacation for he and Eric! Though I unfortunately did not see the show myself, friends of mine who did were good enough to send me a photo of my caricature projected large on a screen above the stage before the show got underway. Just today, I was alerted to this Daily Mail article on John Cleese and his outspoken criticism of how today's political correctness is attempting to restrict what a comedian is allowed to say, particularly in venues on the college and university circuit. Cleese is in good company, as other comedians such as Chris Rock, Jerry Seinfeld, and Bill Maher have made similar observations. And having taught at a college for eleven years myself, I share these views also. Students are not as easygoing as they used to be, and these comedians are quite right to be concerned about the future of comedy when subjected to arbitrary restrictions out of fear of it being considered "offensive".